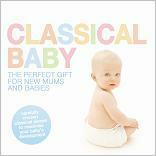 Classical Baby - Music to both Soothe and Stimulate your Child. While this is not the first CD to be targeted at mothers and babies it is an concept that should be repeated more often. The novel aspect of this double album is that it combines two ideas. CD1 (subtitled "Baby Brain Food") aims to promote the well-known "Mozart Effect" that the brain subconsciously finds patterns in classical music which helps to stimulate the development of the brain. Whether this effect really improves intelligence is not certain, but everyone agrees that babies require lots of stimulation to help them learn about the world around them. Music is simply another form of stimulation that exercises other parts of the brain, and early exposure to classical music must surely help to develop an appreciation for music which in later years can add immeasurably to the quality of people's lives. CD2 (subtitled "Soothe and Calm") aims to provide a relaxing environment that will help babies to fall asleep, and every parent knows how useful that can be. Babies are comforted by familarity and familar music can help to create that mood just as much as familiar surroundings and a favourite toy. There is a total of 44 tracks across the two discs, and most of the music will probably be quite familiar to most people. There are a number of classical favouites from Handel's Water Music through to Rimsky-Korsakov's Flight of the Bumble-Bee. Much of the music has a "childhood" theme which is an area which many composers have visited and revisited either for their own children or for future generations. There is The Carnival of the Animals by Saint-Saens, The Nutcracker by Tchaikovsky, The Toy Symphony by Leopold Mozart (the father of Wolfgang Amadeus), Schumann's Scenes of Childhood and Bizet's Children's Games. Some pieces are identified by their use in films and television programmes, and there is also some music composed for film: the guitar solo version of Stanley Myer's Cavatina from The Deer Hunter, and Dawn from the more recent Pride and Prejudice by Dario Marianelli. All in all this is a nice package, simply presented. The cover describes the collection as "The Perfect Gift for New Mums and Babies" and in many ways it's a gift that is just as thoughtful and considerate as the toys and books that are traditionally considered to provide early entertainment and education. And there's sure to be something new and interesting for many adults too. The package is great value and can be found at these links Amazon.co.uk and Amazon.com. And if you want a little preview of the music contained in the double album, here is a short selection: Classical Baby Audio Preview.